In 1998, astronomers used the SCUBA camera on the James Clerk Maxwell Telescope on Mauna Kea in Hawaii to take the deepest image of the sky using a submillimetre camera. Looking at the same patch of sky as the famous Hubble Deep Field image (see picture below), astronomers spent 20 full nights looking at this area and they added all the data together to get the equivalent SCUBA deep field. SCUBA's resolution is poorer than Hubble's but we can see that the blobs in the SCUBA image (from very dusty galaxies) are very different to the thousands of galaxies we see at visible wavelengths with Hubble. After 20 long nights, we see only 5 objects in the SCUBA image, and these are thought to be very distant galaxies, much further away than most of the objects in the Hubble Deep Field. This patch of sky is a similar size to approximately one tenth of the full Moon. In 2006, the Balloon-Borne Large-Aperture Submillimeter Telescope (BLAST) was used to help understand these galaxies by observing a much larger portion of the sky. With Herschel ATLAS, we have the capability of observing larger areas with unprecedented resolution and sensitivity. The first 3% of H-ATLAS data has already been taken, and in this colour image of Herschel pictures taken at 250, 350 and 500um, we see at least 6000 galaxies after only 16 hours of observing with Herschel. This image is 4 x 4 degrees across, just over 60 times the area of the full moon - and it only took Herschel 16 hours! Each pinprick is a galaxy with the brightness related to how much dust they have, and the colour of the galaxy gives an indication of how far away it is (red galaxies are further away from us than the blue ones). 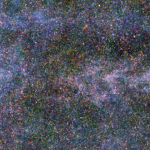 The wispy blue patches are clouds of dust in our own Milky Way galaxy, and there are also a few stars with dusty debris disks in this image as well. Comparing the scales of the images, the SCUBA map is 600 times smaller than the Herschel ATLAS!